How and How Much do Slot Machines Pay in Ontario Casinos? This is a question you might expect to be answered by a seasoned slot machine guru who’s played so long—studied the games so relentlessly—that he (or she) comprehends all there is to know about these unpredictable games of chance. Indeed, many such self-proclaimed experts have attempted to answer this query. But the only one who can really explain it, with indisputable accuracy, is the regulatory body that commands them. The Ontario Lottery and Gaming Corp (OLG) did just that with the publication of a brochure that details exactly how Ontario slot machines pay out their lucrative bounty. Blatantly telling casino patrons that slot machines are designed to take their money clearly hasn’t been enough to stop them from playing. What it has done—for those who bother to skim the materials—is create a society of smarter slot machine players. How Much do Slot Machines Pay in Ontario? A slot machine’s pay out percentage, or return to player (RTP), is designated by the highest gaming authority in the province, the Alcohol and Gaming Commission of Ontario. AGCO is the regulator that oversees the OLG, while the OLG is responsible for oversight of individual casino properties. According to decades-old laws, the AGCO demands all Ontario slots machines pay out at a minimum 85% RTP. That doesn’t mean all slots are set to pay 85%. Not all machines pay an equal RTP, either. Each game is set individually, and may range (by law) anywhere from 85% up to 99.1% RTP. The average payout across all casinos is about 92%. How do Slot Machine Pay Out? To the unaware, it may seem there’s some high-powered executive sitting in a luxury office on the top floor of each casino, watching the patrons spin the reels and deciding on whatever whim tickles his fancy to press a button that releases the almighty jackpot to one most fortunate player. That’s not how it works at all. In fact, the casinos have absolutely no control over slot machine pay outs. Aside from setting the RTP rate, no one does. Being utterly random, slot machines are entirely unpredictable. Every win or loss is decided at the precise moment a player presses the spin button. This valuable piece of information debunks the common myth that a player who sits down at a machine after you, and subsequently wins a big payout, has ‘won your jackpot‘. Had you continued playing, odds are you would not have pressed the spin button at the precise nano-second that the next player did. No slot machines is “due for a win”, no matter how long it’s been since the last strike. No machine records its history. Every spin is irrespective of those before it. You could play for hours and end with a loss, or play just one spin and strike a jackpot. It is truly that random. What are the Odds of Winning a Slot Machine Jackpot? The RTP and the odds of winning a jackpot are two very different things. How much slot machines pay overall is determined by the RTP. How likely a player is to win a jackpot on any given spin is determined by the jackpot odds. According to the OLG, the odds of striking one of their jackpots can vary significantly from one machine to the next. It all depends on the number of columns and rows on the reels, the number of symbols in the game, and the specific requirements for unleashing the ultimate prize. This does not mean, however, that playing a best-case-scenario slot for 4,000 spins is likely to net you a jackpot. Refer back to the random, unpredictability of the games for the answer to this conundrum. The common misconception that playing long enough will eventually reward a big prize is an insufferable falsehood. 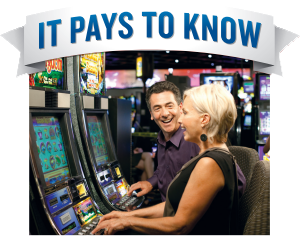 The OLG makes every effort to teach players how to be responsible when playing the slot machines at Ontario casinos. It offers a responsibility checklist to help players enjoy a fun and safe gaming experience. Spending Limit: Set a money limit for how much money you’ll spend. Time Limit: Set a time limit for how long you will play. Responsible Budget: Don’t spend more than you can afford. Let It Go: Don’t try to win back what you’ve lost. Entertainment Only: Always remember that playing slot machines is entertainment and not a way to make money.